An Igbo proverb says: “ana ebu uzo anaputa nwa okuko n’aka odum tupu ewere juba nwa okuko obu gini ka ona acho n’aka odum”. When translated into English language this proverb means that “it is after you have saved the fowl from the lion that you can ask the fowl what it is doing in the hands of the lion.” This proverb accentuates what I call the lion and the fowl dilemma. It is a dilemma because one has to choose whether to first save the fowl and then ask questions later how the fowl got into the hands of the lion or to dwell on the questions first while the fowl perishes in the hands of the lion. Since 1999 when Nigeria embraced democratic government, Nigeria has found itself in the lion and the fowl dilemma. 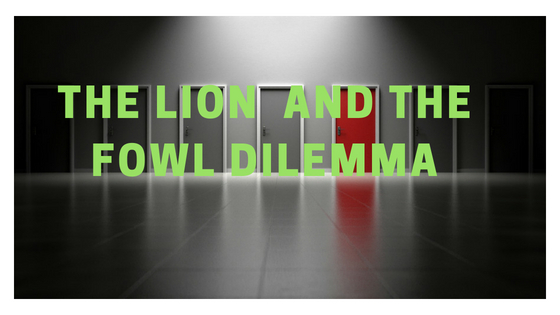 In this dilemma, while Nigeria suitably depicts the fowl, past presidents depict the lions and Nigerians befittingly depict the decision makers – that is people who decide whether to save the fowl or allow the fowl to perish in the hands of the lion. Though this dilemma draws attention to Nigeria’s circumstances in the past administrations, however, the administration of (ex) President Jonathan, somehow, draws particular connection to this dilemma. During (ex) President Jonathan’s administration there were uncountable times when his incompetence as a president was like a pregnancy that cannot be hidden; even those close to him found it difficult to hide. Indeed, many Nigerians at the nick of 2015 elections were looking for a suited substitute for (ex) President Jonathan. Though General Buhari (now president) appeared to be the suited substitute amongst other presidential candidates, yet some Nigerians, including me, questioned his competence. I found his anti-corruption credentials as they were propagated fulsome. But he was elected the president of the Federal Republic of Nigeria nonetheless. Even though, I had no conviction on who amongst the numerous presidential aspirants were suited to take the mantle of leadership from the former president, Dr Jonathan, however, I often found myself invoking the Igbo proverb aforementioned to justify the need for Nigerians to vote against the former president, Dr Jonathan. For me, Dr Jonathan was the lion and Nigeria was the fowl. Thus I did not concern myself with the question about how we, Nigerians, even elected him, Dr Jonathan, in the first place to be our president, rather I was interested in saving the fowl from the lion. I felt that we would have time afterwards to ask how we elected a man, who under his watch Nigeria was plunging into economic quagmire given the way public funds were blatantly looted by public officials. Fortunately, the die was cast and Dr Goodluck Jonathan lost the election, despite the long-lasting myth that an incumbent president in Nigeria possesses electoral invincibility. And remarkably Dr Jonathan accepted defeat. However, we, Nigerians, failed to ask the important question about how we handed the mantle of presidency to Dr Goodluck Jonathan in the first place. Today, unfortunately, we are faced with the same lion and fowl dilemma under President Buhari. Again, I am concerned with saving the fowl first and then afterwards we can ask how we, Nigerians, elected a man whose incompetence as president is recalcitrant. I am not interested in the question about how we, Nigerians, elected as president a man whose intolerance as a leader is upsetting and persistent, rather I am interested in saving the fowl first from the lion. Under President Buhari’s nose public funds are looted by his chums, yet he still basks in euphoria of anti-corruption czar. Under his watch Nigeria is worse off as a country than it was in the past when compared with other emerging economies, and more Nigerians live in hunger and poverty today than in the past, yet he still basks in euphoria of change mantra. Under his presidency more young people are trapped in unemployment circle, yet he still lives in euphoria of self-acclaimed glory. Under his government insurgents carry out successful terrorist attacks and wanton herdsmen have a field day in carrying out heinous attacks in many communities across the country, yet he still lives in euphoria of self-proclaimed victory. As the clock for the year 2018 ticks fast and 2019 elections draw close, we, Nigerians, are faced with the lion and the fowl dilemma. Like the proverbial lion and fowl, President Buhari is the lion and Nigeria is the fowl. We, the people, have a choice in 2019 elections to use our voting rights to the best of our ability to either save the fowl, Nigeria, or waste our time asking questions about how the fowl got into the hands of the lion, President Buhari. I hope that as a people we will focus our energy on saving ourselves, our lives, our children, our welfare, our property, our destiny, our future, and above all our dear country, Nigeria, from the hands of the lion we currently have as president. There is a possibility that if we fail to save the fowl, the lion may not only devour the fowl in front of us, but also may come after us. So, let’s save Nigeria with our votes in 2019 elections because Nigeria is all we have got.